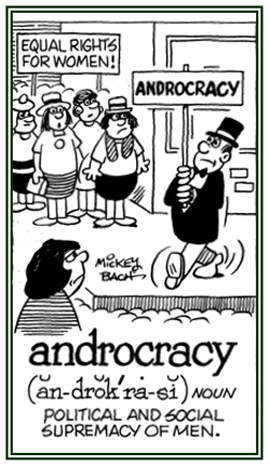 An organization with little or no structure; the opposite of requiring unnecessary procedures: The adhocracy is a system that is designed to be flexible and to be quickly responsive to the needs of the moment rather than being excessively bureaucratic or involving a lot of complicated rules, details, and processes. There are those who say that adhocracies consist of managements that respond to urgent problems instead of delaying them or trying to avoid them. A government which is dominated or controlled by white men or Europeans. A form of government in which the officials are decided by chance: The new aleatocracy of a few countries have resulted literally by drawing names from a hat for the president and vice president. The political and social control and rule by males; masculine supremacy: Many countries in the world can be considered to be androcracies because the leaders are usually men and never women. © ALL rights are reserved. Relating to a social system or government which is controlled or dominated by men. A government controlled by the wind or by political decisions instead of serious research and practical applications: The miserable state of an anemocracy is when people who put their trust in irrational procedures are merely governed by the "windy" impractical arguments of politicians. A government run by angels. The principle of opposition to all forms of government and to any restraint of individuals by laws: "Believers in antarchism are against any organized government." 1. The government of a state by its “best” citizens. 2. That form of government in which the chief power lies in the hands of those who are most distinguished by birth or fortune; a political supremacy of a privileged order. 3. The class to which such a ruling body belongs, a patrician order; the collective body of those who form a privileged class with regard to the government of their country; the nobles. Aristocracy is popularly extended to include all of those, who by birth or fortune, occupy a position distinctly above the rest of the people and it is also used figuratively regarding those who are superior in other respects. There are bad manners everywhere, but an aristocracy is bad manners organized. A member of one of a ruling oligarchy; hence, someone who is a member of a patrician order; such as, a noble: An aristocrat is usually someone who has a high position in society because of birth, rank, or title and favors the control of common people with a form of government which is not a democracy. A dedication to having special behavior for people in high positions in society because of birth, rank, title, intelligence, and/or wealth. A form of government in which power results from the group that holds the numerical majority in a country: An arithmocracy can be a good form of government, or it can have negative results, depending on whether there is a balance between governmental rule and individual liberty. If someone with arithmocracy wants to do away with criticism of the government with the hope of assuring national harmony, it would not get by with passing a law forbidding the media or private citizens from openly challenging any political decisions! A form of government in which a country is ruled by one person, or group, with total power or unrestricted control over all of the other citizens: An autocracy involves a system in which someone makes decisions which are subject to neither external legal restraints nor regularized mechanisms of popular control. Showing page 1 out of 9 pages of 129 main-word entries or main-word-entry groups.